Heat oven to 350°F. Line 13x9-inch pan with foil, letting foil hang 2 inches over sides of pan. Spray foil with cooking spray. In large bowl, mix brownie mixes, water, oil, eggs, ginger and cinnamon until well blended. Spread in pan. Using foil to lift, remove brownies from pan, and peel foil away. 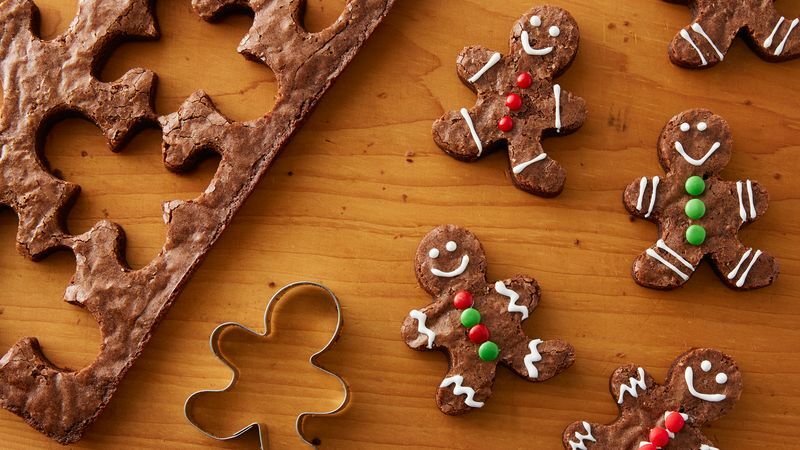 Cut out 8 gingerbread men using 3-inch gingerbread man cookie cutter. Gently push brownie out of cutter each time. Set aside end pieces for snacking. If cutter gets sticky, wipe clean with damp paper towel before cutting again. Decorate each gingerbread man with cookie icing; place candies for buttons. Let stand about 30 minutes or until icing is set. Store covered in airtight container at room temperature with waxed paper between layers. To easily line bottom of pan, tip upside down, and form foil around bottom and sides. Flip pan over, and place foil insert inside pan for a perfect fit! Try extra brownie pieces as a topping for ice cream sundaes!